Seeing as how we cook nearly every meal at home, I sometimes find it challenging to come up with something to make for lunch that isn’t just a) leftovers, b) cheese sandwiches, or c) leftover-and-cheese sandwiches. To make things more interesting, I have also been playing a game called “What can I make for cheap or free?” (a fun little challenge that can actually be applied to more than just food…). 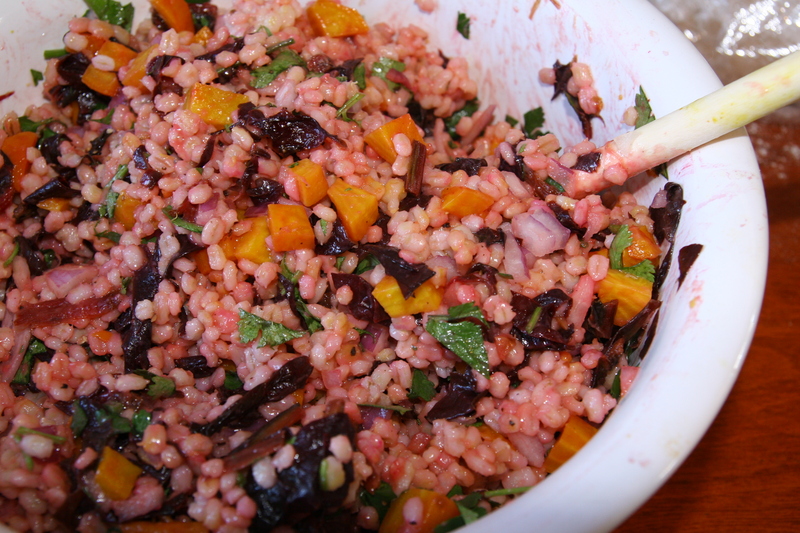 So, I am pleased to share my most recent solution to this puzzle: Barley, Beet & Chard Garden Salad. In surveying the pantry, I had a revelation that the normal go-to emergency meal of pasta + sauce + veggies can be easily translated to whole grains + sauce + veggies. Frankly, it’s not a new idea, but for some reason the combination never quite came up in a quick mental scan for inspiration before. We planted some golden beets from seed way back when, and hoped they’d grow into full sized root bulbs. Alas, they never quite got to an adolescent growth spurt, but the little baby beets have been patiently waiting for me to use them now for weeks. I uprooted, scrubbed and roasted nearly all of them. I also picked some chard (yes, it just keeps growing back!) and cilantro to toss in. Basically, that’s all there is in the salad, along with some spices, olive oil and lemon – zest and juice. Frankly, I think it turned out pretty tasty. And, since I made a gigundo batch, there was plenty for lunch for the next few days. Since we’ve been out cutting down trees and clearing land these last few weeks, it’s pretty sweet to have something ready to eat when we come in for a break. 1/4 red onion, minced & soaked in water for 30 mins. Boil the water and add barley with a generous pinch of salt. Cook 30 mins, then drain if extra water remains. Make sure the beets are squeaky clean, then wrap them in foil and roast at 400º for 30 mins or so until cooked through. Let them cool, then slip off the skins and chop in to cubes. 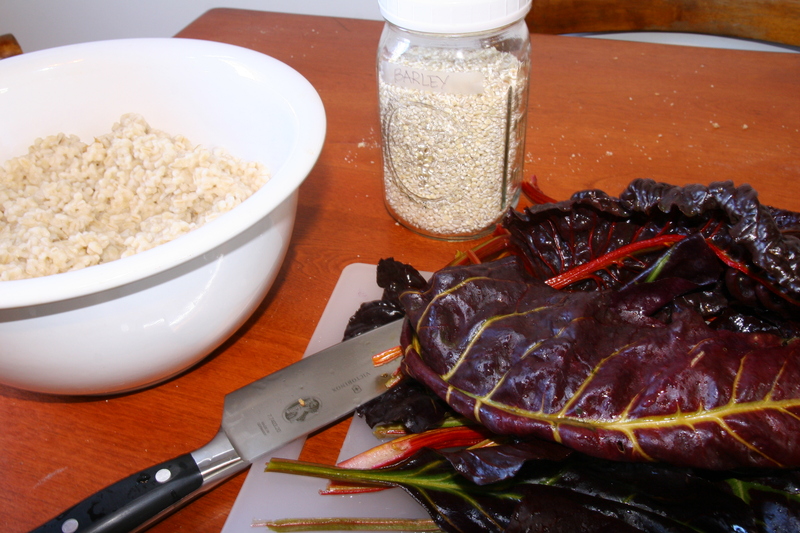 Cut the chard leaves from the stems; cut the stems to bite size and leaves into small ribbons. Sauté the stems with garlic in a little olive oil, then add the leaves and half of the lemon juice. Cover and steam until the leaves are wilted. Drain the red onion. Whisk the remaining lemon juice with a few tablespoons of olive oil, then combine everything in a large bowl and toss together. Add salt and pepper, as you like.